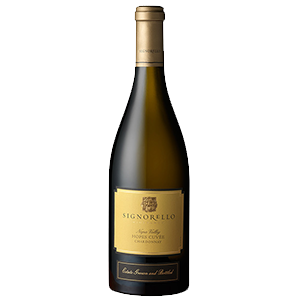 2011 Napa Valley, California Signorello Vineyards "Hope's Cuvée"
Careful pressing of whole clusters minimized skin contact. This gentle process helped the wine achieve balance as well as develop a silky mouth-feel and enhanced the aging potential. Using native yeasts, the wine fermented in French oak barrels, did not undergo malolactic fermentation and spent 9 months on the lees in French oak barrels (50% new) prior to bottling. Chardonnay's favored position among wine drinkers is well established. Our 2010 Chardonnay is fresh and lively yet pleasantly round with a gorgeously complex nose and a surprisingly lengthy finish. Think lemon chiffon pie: citrusy and bright yet a bit toasty and creamy. Vineyards in Napa Valley's cool southern end are at the heart of this wine's exquisite execution. Wine is made in the vineyard is a phrase heard often around here. Our 2010 vintage illustrates this fact very well. The utilization of whole-cluster pressing, barrel fermentation and sur lie aging are among the traditional steps employed to create this crowd-pleasing stylish wine. Bright fresh and lively, this white serves up lots of citrus including mandarin orange and pink grapefruit with some peachy notes. Very vivacious and bristling with acidity, while the subtle oak is really nicely integrated, offering hints of toast, vanilla and hazelnut. Supple texture, medium bodied with good length. 2011 Sonoma Valley, California Three Sticks "Durrell Vineyard"
This wine is rich and expressive with aromas of stone fruit, crème brûlée, baked apple and pear. More stone fruit, lemon and golden apple flavors fill out the full-bodied palate. The finish is long and lively, with the acid delicately balancing the texture and complexity. Aged in 60% new French oak and made with a good dose of malolactic fermentation, this Chardonnay is dominated buttered toast and popcorn flavors. It’s an opulent style of Chardonnay, but obscures pleasant flavors of tropical fruit, pear and apricot. Cuvée (blend) crafted from batches of Chardonnay grown at several estate vineyards, each contributing its own distinct personality. Its juicy tropical aromas of pineapple and mango interweave with hazelnut or almond, and a touch of lime. A sip shows slightly different flavors, dancing between grapefruit, lemon and pear with a subtle hint of vanilla. It is medium-bodied with a flinty, mineral finish that stays clean due to a firm acid backbone. This cuvée offers alluring fruit and floral aromas of citrus, peach, melon and white flowers. The cool growing seasoned allowed for extended hangtime, underscoring high tone tropical notes on the palate, with sur lie aging adding lovely elements of graham cracker, clove and brioche. Throughout, excellent acidity and a core of minerality keep the wine focused and fresh, adding definition to flavors of green apple, summer melon and peach. The finish is long, crisp and minerally, with a lingering note of lemon zest and subtle spice from oak aging. Crisp, bright and fresh! This racy chardonnay has bright aromatics of honeysuckle and fig with wonderful fruit flavors of pineapple and mandarin orange. There is a fantastic orange peel and slate like minerality to this wine that gives it great acidity and balance on the finish. With no oak and no malolactic fermentation this wine struts around a bit more like a Macon Villages or a Pouilly Fuissé than a California Chardonnay. 2013 Sicily DOC, Italy Cusumano "Jalé"
2010 Rheingau, Germany Weingut Losen-Bockstanz "Wittlicher Lay"
2012 Sancerre AC Henri Bourgeois "Les Chapelle des Augustins"
2007 Brunello di Montalcino DOCG, Tuscany Tenute Silvio Nardi "Vigneto Manachiara"
2007 Brunello di Montalcino DOCG, Tuscany Marchesi di Frescobaldi "Castel Giocondo"
2012 Romagna DOC, Emilia-Romagna Trerè "Vigna del Monte"
2006 Barolo DOCG Manzone Giovanni "Bricat"
2008 Barolo DOCG Paolo Scavino "Bricco Ambrogio"
2007 Barbaresco DOCG Cantina del Pino "Ovello"
2010 Langhe DOC GAJA "Sorì San Lorenzo"
2009 Langhe DOC GAJA "Sperss"
2009 Langhe DOC Manzone Giovanni "il Crutin"
2011 Barbera d'Alba DOC Bruno Giacosa "Casa Vinicola"
2011 Dolcetto di Dogliani DOC San Fereolo "Valdiba"
2011 Chimney Rock Winery "Tomahawk Vineyard"
2010 Howell Mountain AVA Ladera Vineyards "Reserve"
2008 Dry Creek Valley AVA, Sonoma Valley, CA Merriam Vineyards "Jones Vineyard"
2010 Bourgueil AC, Loire Valley, France Lamé Delisle Boucard "Dom. des Chesnaies"
2010 Lujan de Cuyo (Perdriel district), Mendoza, Argentina Achaval-Ferrer "Finca Bella Vista"
2010 Alto Valle Rio Colorado, Argentina Bodega el Desierto "25/5 La Parma"
2012 Napa Valley, California Markham Vineyards "Cellar 1879 Blend" Merlot- Petite Sirah- Cab Sauv. 2010 Central Valley, California Jeff Runquist "Damir Ranch"
2009 Nuits-St-Georges AOC, Burgundy, France Bertagna Vougeot "Les Murgers, 1er Cru"
2011 Givry AOC, Burgundy, France Gerard & Laurent Parize "Champ Nalot"
2011 Willamette Valley AVA Bethel Heights Vineyard "Estate"
2011 Anderson Valley AVA, Mendocino Donkey and Goat "Helluva"
2011 Carneros AVA, Napa Valley Cuvaison "Estate"
2013 Santa Maria Valley AVA, Santa Barbara Belle Glos "Clark & Telephone Vineyard"
2011 Santa Maria Valley AVA, Santa Barbara Sanctuary Wines "Bien Nacido Vineyard"
2010 Santa Rita Hills AVA, Santa Barbara Sanford Winery "La Rinconada Vineyard"
2010 Napa Valley, California Hendry "Block 28"
2011 Napa Valley, California Hendry "HRW"
2011 Dry Creek Valley AVA, Sonoma, California Terlato Wines "The Federalist"
2010 Dry Creek Valley AVA, Sonoma, California Francis Ford Coppola "Director's Cut"